AIR3D Hair Dryer is rated 4.7 out of 5 by 36. 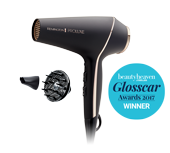 Our next generation hair dryer is here, the AIR3D – with a new structure to hair drying and designed for fast smooth styling. Rated 5 out of 5 by Spap85 from Great product Awesome power and very pretty/ attractive device. Ultra modern and works well also. Very compact and great packaging. Rated 5 out of 5 by Anonymous from Great style This hair dryer can make my hair look very fluffy and has a lot of hair. So this hair dryer made me feel very surprised, and the style I blew out was very satisfactory. Rated 5 out of 5 by tlsl from Lightweight, less noisy and heats up quickly! I found it reduced the time I spent blowdrying wet hair. Less frizz. Very pleased with the results. Perfect for anyone who is in the market for a dryer within the $200 range. Rated 5 out of 5 by Fifi1984 from Easy to use I purchased this hair dryer as a gift for myself and absolutely love it! It’s easy to use and quiet. It has a low heat setting which is great for diffusing without the frizz (If you have heard of the curly girl method you will know about about that) I would highly recommend this dryer! Rated 5 out of 5 by Disadvantage from Reliable Dryer Bought a couple of months ago for my partner. Seems a high quality dryer. She loves it. I recently bought this dryer and pressing the cool shot button doesn't seem to do much! It is only slightly cooler on setting 2 and 3..no difference on 1 and definitely not cool. Is this how it works or is my dryer faulty? I otherwise love the dryer! Hello. Is this dryer only available in rose gold in Australia? (I&rsquo;d prefer the white &amp; black.) Thanks! Hi! Is the high torque motor in your hair dryer a longer lasting AC motor like a salon uses? Thanks. I've heard about long hair getting sucked into the back of the dryer. How is this prevented? Hi, I'd like to know if the air dryer is bi-volts (110 and 220). Because I am living in Australia at the moment but sometimes I Travel to Brazil and the voltage is 110.